The Academic Team features head to head competition, quick response answers, time limits on questions and use of recognition systems by participants. Fields of study include, but not limited to science, mathematics, social studies, literature, fine arts, language arts, religion, and miscellaneous/vocational education. Zion’s Academic Bowl team is comprised of Jr. High students. Students practice once a week after school beginning in Janurary. The Academic Team participates in a series of practice meets leading up to the State Academic Meet. The team is coached by a Zion staff member. Balanced Literacy is a comprehensive, differentiated approach to reading and writing instruction. It is a framework designed to help all students learn to read and write effectively using the following three components: Reading, Writing, Language/Word Study. It is based on the premise that all students can learn to read and write through scaffolding. Balanced Literacy allows for flexibility within the classroom. It allows the teacher to meet each child where the student is and move the student forward in a manner and time suited to the individual. Zion is proud to employ a part time literacy coach to assist teachers in the planning of their small group work and lessons. The literacy coach is also a reference to teachers in learning new strategies and evaluates students to assist with the placement in the appropriate Guided Reading level. In sixth grade different math classes are offered to best meet the needs of our students. Transitional Math (6TM) and General Math (6GM) will both use the same textbook. Transitional math activities will include additional review, reinforcement of concepts, and a more concrete approach. 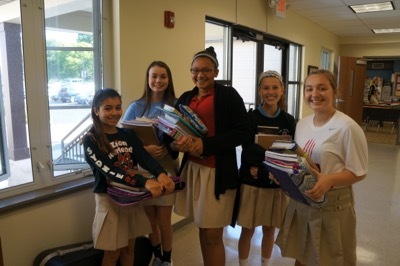 These students are on target for Pre Algebra in 8th grade. The General Math class will also have reinforcement of concepts but will delve into more abstract concepts and mathematics investigations. These students will be on target for Pre Algebra in 7th and Algebra in 8th grade. Students will be evaluated each year to determine the best fit for their needs as learners. Bienvenidos! Welcome! Zion Spanish class is held two class periods each week in both grades 7 and 8. All students choose a Spanish name the first week of class. They also learn and list the many important reasons to learn Spanish- a fun and easy language that has become increasingly spoken around the world. Spanish classes include a variety of units which emphasize vocabulary, grammar, and spoken conversation. A special language software program called Rosetta Stone is presented regularly in the classroom using the SMARTboard. While 7th graders focus on the country of Mexico, 8th grade students select a specific Spanish speaking country to explore and discover throughout the year. All students attend three fiestas to enjoy the food, crafts, and music of Spanish and Latin American culture. Custom Language School offers an after school program of Spanish Language instruction at our school. The classes meet every Thursday from 3:00-4:00 PM. The after school program is a tuition based program. A flyer was sent home with each student in Kindergarten-4th grade at the beginning of the year with more information about the program. All registrations and tuition should be mailed to Custom Language School. Please contact the school office or Custom Language School, 636-300-9129, if you have any questions. Students in 5th grade participate in 2 weeks of Lego robotics. Through the robotics course students use a hands-on, minds-on approach designed to help students take ownership of the learning process, enabling them to actively develop the problem-solving skills and collaborative outlook necessary to become creators.